Jesus made the disciples get into the boat and go on ahead to the other side while he would send the crowds away. After sending the crowds away he went up into the hills by himself to pray. When evening came, he was there alone, while the boat, by now far out on the lake, was battling with a heavy sea, for there was a head-wind. In the fourth watch of the night he went towards them, walking on the lake, and when the disciples saw him walking on the lake they were terrified. ‘It is a ghost’ they said, and cried out in fear. But at once Jesus called out to them, saying, ‘Courage! It is I! Do not be afraid.’ It was Peter who answered. ‘Lord,’ he said ‘if it is you, tell me to come to you across the water.’ ‘Come’ said Jesus. 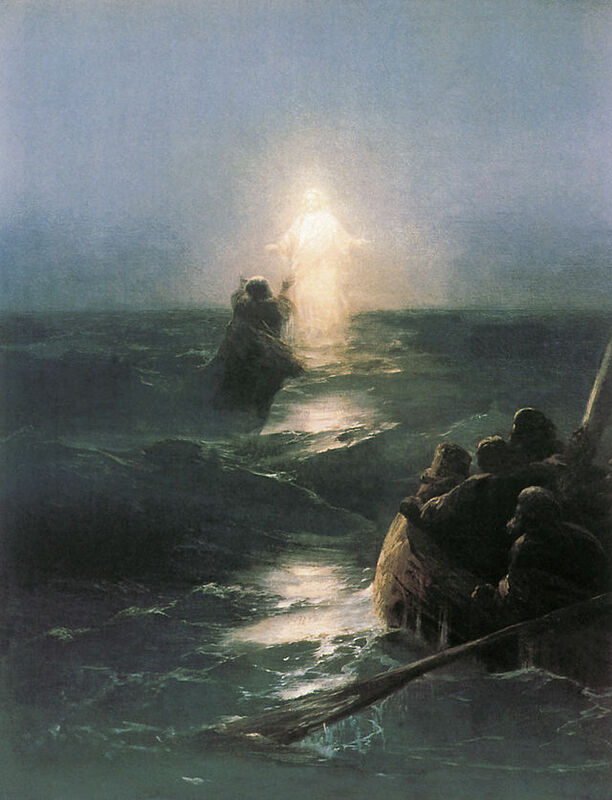 Then Peter got out of the boat and started walking towards Jesus across the water, but as soon as he felt the force of the wind, he took fright and began to sink. ‘Lord! Save me!’ he cried. Jesus put out his hand at once and held him. ‘Man of little faith,’ he said ‘why did you doubt?’ And as they got into the boat the wind dropped. The men in the boat bowed down before him and said, ‘Truly, you are the Son of God’. A most strange gospel story – Jesus walks on the water. It’s the type of gospel that suits a decision time, a time of deep trust – an invitation to come to the water; not to be afraid. It’s about trusting in Jesus, when there is nothing else. If you have human help, it’s great – but not the same as trusting in God. Death and funerals….trust in me. Why – because “I am the way and the truth.”. Old age can be the same, or times of life when we just don’t know what the future will hold. Or Illness. We meet it regularly. Sounds strange but what Jesus does in this situation is very human — not a lecture, but holding hands! Someone was given a book on bereavement once – he said he needed a hand to be held, or tears to be heard. That’s Jesus. He held Peter …..God is a God with skin, with a human heart, and leaves all sorts of big ideas behind when we are in trouble. Jesus just went across the lake, stopping his comfortable prayer. Another time Peter would jump into the lake again – after the resurrection! Always a water man! Then he would be asked not just to hold a hand, but to be the hand that would reach out to others. He prepares each of us for our mission, always with us in our efforts to live in love and service of him. This entry was posted in Gospel of Matthew, Gospel Reflection, Liturgy Resources, Prayer Resources, Scripture and tagged decision, Donal Neary SJ, Doubt, Faith, Gospel Reflection, Matthew 14:22-33, Miracle, Pope Francis, Sunday Gospel Reading and Reflection for 10th August 2014, Sunday Scripture and Reflection for 19th Sunday Ordinary Time Year A, Trust, trust in God, walking on water.